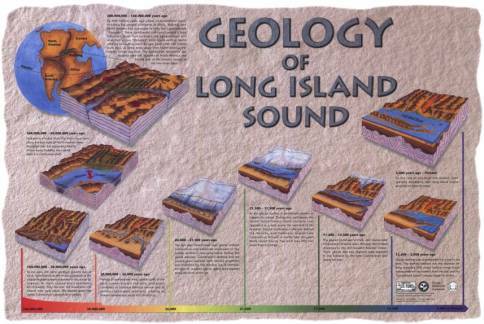 This section is an expanded description of the Geology of Long Island Sound poster was published by the Department of Environmental Protection through the Long Island Sound License Plate Program in cooperation with the Mystic Marinelife Aquarium. A full size version of the poster is available in PDF (16.7 mb). Department of Energy & Environmental Protection and University of Connecticut partnership.